The Filter Minder's wireless sensors and receivers send filter performance data to the Cloud. 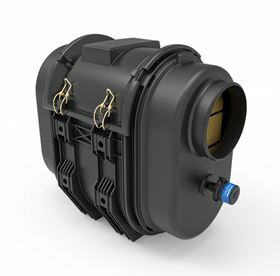 The Donaldson Company has introduced its Filter Minder connected technology for monitoring truck engine air filters, using the vehicle’s own telematics system. The Filter Minder's wireless sensors and receivers send filter performance data to the Cloud, and predictive analytics inform the fleet manager when filters on individual trucks are approaching the end of their optimal life. The Filter Minder monitoring system integrates with existing fleet management technology and offers simple installation, low-energy sensors that help conserve power and extend battery life and filtration insights for an entire fleet of trucks with customizable alerts by text, phone, email or dashboard. A scalable platform that can expand to monitor fuel, lube and hydraulics filters, with additional applications is currently being developed by Donaldson. Each filter in Donaldson’s Turbo-Tek line receives an Er|W|P rating.